It was early evening and a fairly routine enquiry took me to a modest house on the edge of town. Little did I know what horrors lurked behind the peaceful facade of idyllic suburbia. After knocking on the door I noticed, through the frosted glass, someone approaching wearing what appeared to be a close-fitting brownish ensemble. 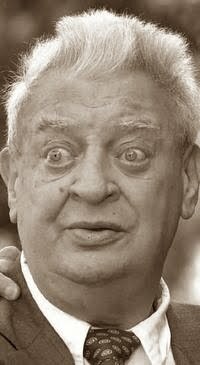 When the door opened, however, I was confronted by a naked Rodney Dangerfield. Well, it wasn't Rodney Dangerfield although he certainly had more than a passing resemblance to him. That wasn't the first thing that occupied my thoughts, no, it was the shock of all that wrinkly skin on display. You will recall, Dear Reader, that I said he was *naked* right? Okay, technically, he wasn't completely naked either but his very brief briefs, or possibly a male g-string (I didn't want to continue with further enquiries in that direction thank you), didn't really conceal a lot. I don't know what the point of that little bit of cloth was, it certainly wasn't for "modesty". And what are you supposed to say when a more or less naked 63yo man cordially invites you into his house? The whole incident took another lurch into the bizarre as I asked him various questions in relation to the matter at hand. I simply could not understand what he was saying. Not because his answers were unintelligible or he had a speech defect but because his answers were not in the context of the questions being asked! When I asked him to confirm his phone number, for example, he talked at length about buses or at least that's what I thought he was talking about, even now I can't be sure. After around 20 minutes, I left the property more confused than when I entered, and strangely burdened by a feeling of ineffable sadness.